Our thoughts, prayers and hearts are with all of those affected by the devastating floods around Fremont and the surrounding area. Fremont is a place we proudly call home, where everyone is our neighbor, and can’t imagine the hardships of our dear fellow residents. But, we know Fremont, the State of Nebraska and our neighboring states will come back stronger and better than ever. A sincere thank you to the first responders, volunteers, supporters and members of these resilient communities that are helping in the recovery. There is no place like Nebraska. We also wanted the opportunity to say Moostash Joe Tours is doing well and operations are continuing on as normal as flood waters remained outside of our immediate area. Returning travelers were also able to return home safely last weekend and early this week as well. Thank you for your continued thoughts, prayers and concern for us and our community. We had a number of bus tours returning the past couple of weeks and want to show off their great photos! Click each respective tour name to see the tour specific photos! This small town in Northwest Illinois is a BIG DEAL! 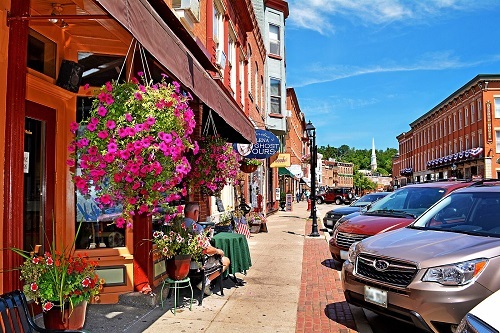 Attracting nearly a million visitors each year, Galena, Illinois and the surrounding area is soon to be one of your favorites. Enjoy excellent downtown accommodations at the historic DeSoto House Hotel, visit the areas top attractions, sip local wines and enjoy plenty of free time exploring this Midwestern shopping mecca! Click HERE for more details! 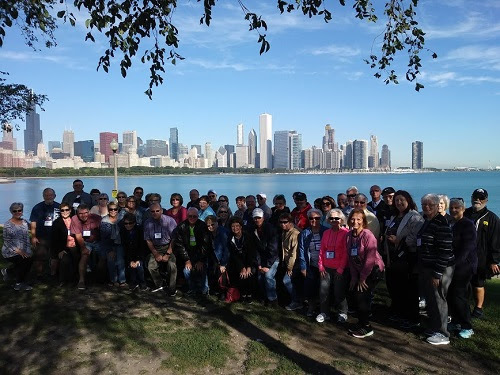 This entry was posted in Announcements and tagged bus tours, bus tours from Nebraska, Moostash Joe Tours on March 22, 2019 by Moostash Joe Tours. What an amazing couple of days! Nebraska City was the perfect destination for our 3rd Annual Tour Director and Office Staff Retreat! It was a great time to connect, share ideas and have a little fun – with the main objective being maintaining the highest level of customer service and making your travel experience the absolute best it can be! This entry was posted in Announcements and tagged bus tours, Moostash Joe Tours, Tour Director on January 24, 2019 by Moostash Joe Tours. Happy New Year from all of us here at Moostash Joe Tours! We hope 2018 was a year full of wonderful memories, and it certainly was for us! We can’t wait for our 2019 bus tour lineup to begin as there are so many spectacular places to see, things to do and friends to meet. Take a look below at some featured tours, savings opportunities and happenings early this year here at Moostash Joe Tours. Feel free to browse our website for past tour photos and complete information on each and every one of our tours. Also, if you have any questions, Cindy (our Tour Specialist) would be happy to answer them on the spot. Just click the “Chat now” box in the lower right hand corner on our website. Below is a list of NEW tours with availability during the first half of the year. Click the tour title below to see complete tour information! Take advantage of these savings and senior discounts! Click the title for complete tour information! The perfect way to see Switzerland’s breathtaking mountains, charming mountain communities, fascinating old towns and beautiful lakes! Book by Feb. 1 & receive $200 off per person! The most inclusive tour of Alaska out there! Enjoy a spectacular 7-night cruise aboard the Norwegian Jewel up the Inside Passage from Vancouver, BC to Seward, AK. Then, continue on deluxe motor coach through the interior, including Denali National Park, ending with your flight home from Fairbanks! Book by March 1 & receive $200 off per person! This incredible Ireland tour takes you through Ireland’s most popular cities, charming small towns and most breathtaking scenic highlights! Book by March 11 & receive $200 off per person! A huge hit in 2018! Featuring two nights in Denali National Park! Also includes Anchorage, Valdez, Fairbanks, Chena River Cruise, Iditarod Musher Kennel Tour, Alaska Salmon Bake and the world’s most spectacular scenery! Book by March 15 & receive $200 off per person! Hip Hip Hooray! Happy Birthday to our very own Nancy Watters! For those of you who don’t know Nancy, she has been working hard in the office for over 4 years now. If you’ve been on a tour before or even just inquired about a tour, she’s most likely the one you had a conversation with! We’re celebrating all month long, so next time you call in or stop by, make sure to wish her a happy birthday! Joey and John Spellerberg are once again headed to the American Bus Association’s annual Marketplace! This year’s Marketplace, located in Louisville, KY at the end of the month, features thousands of people and bus travel-associated companies from all over the United States, gathering to strengthen relationships and share ideas. With over 200 separate meetings for EACH of them, they are committed to being the first to market and on the cutting edge of the industry, giving you the best possible tour and the most value for your money. Also at ABA, stay tuned for an announcement which awards Moostash Joe Tours one of the most prestigious awards in the group travel industry! 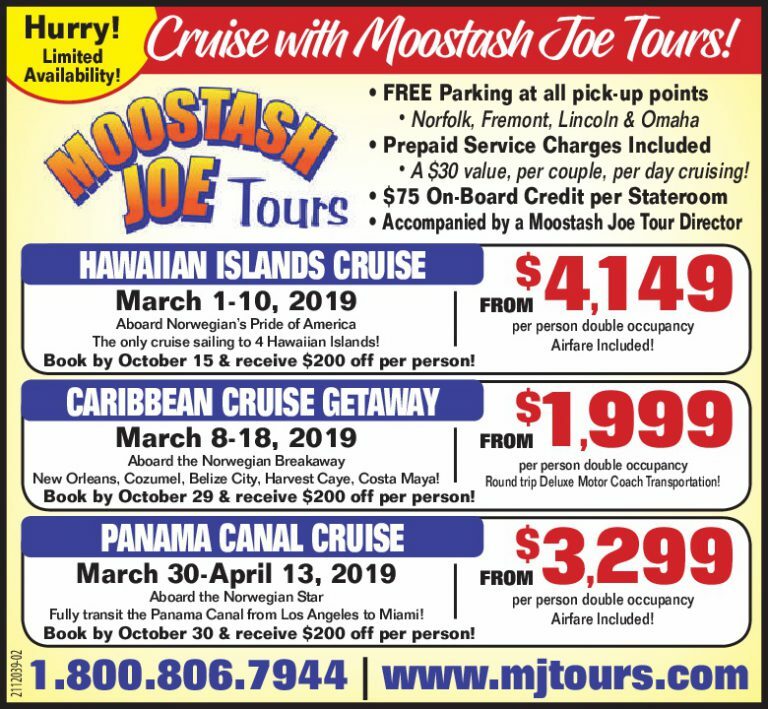 This entry was posted in Newsletters and tagged Alaska tour, bus tour, Moostash Joe Tours, senior discounts on January 24, 2019 by Moostash Joe Tours. Season’s Greetings and the Merriest of Christmases from ALL of us here at Moostash Joe Tours! We believe the best way to stay warm and spend this time of year is sharing it with the presence of those close to you. We’re so thankful for the many incredible people we have around us, sharing our passion for travel and our mission, helping people experience the majesty and wonder of God’s creation through travel. We also want to take this opportunity to tell you how grateful we are for YOU, your support and your patronage of Moostash Joe Tours this year. It was a year full of many wonderful memories, amazing fun and fastastic people like yourselves. None of what we do would be possible without you, and we’re so excited to continue our 40+ year tradition of travel for many more years to come. So from our family to yours, a very sincere thank you. Take a look through a couple of the many highlights from 2018, below! Now THREE dates in 2019! Click the group photo for complete tour details! TEN Waco, Texas & Magnolia Market at the Silos Groups in 2018! FOUR Autumn in New England Groups in 2018! I love traveling with Moostash Joe, a man whom I’ve never met. He puts together wonderful tours; our money and time is well spent. He does all the planning, makes reservations, and gets us there on time. The cuisine is great, and twice a day we dine on his dime. But it isn’t just the food, or the destination, it’s the friends we make. That’s what keeps us coming back on all the trips we take. On day number one we are strangers, at least for the most part. On the last day, as we say our good-byes many are etched on my heart. It all starts on the first morning break, as we enjoy our apple fritters. We start to interact and meet one another as we develop the coffee jitters. During the morning break, or at lunch, we start to mingle and bond. By the end of the journey we all have friends with whom we are very fond. But as I look back, it’s the people I’ve met that really keep me smilin’! Nowhere else will you find such a variety of tours, lowest prices and top destinations than you will with Moostash Joe Tours! 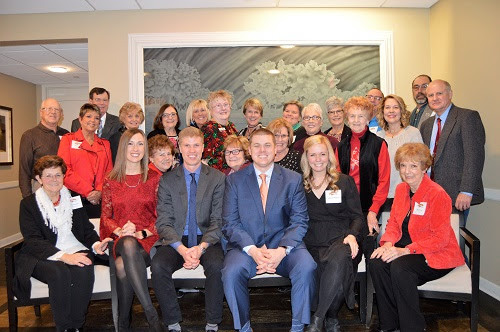 This entry was posted in Announcements and tagged bus tours, bus tours from Nebraska, Moostash Joe Tours, motor coach tours on December 21, 2018 by Moostash Joe Tours. Make 2019 your year to CRUISE! Don’t miss out on these great savings before the deadline! This entry was posted in Announcements and tagged bus tours, Bus tours from Iowa, bus tours from Nebraska, Moostash Joe Tours on September 4, 2018 by Moostash Joe Tours. This entry was posted in Announcements and tagged bus tours, Bus tours from Iowa, bus tours from Nebraska, Moostash Joe Tours on August 8, 2018 by Moostash Joe Tours. New England, Mackinac Island & More! Autumn in New England – NEW DATE! One of our most popular tour was even more popular than we thought! Fall is quickly approaching, and so are our Autumn in New England Tours! As a year-after-year traveler favorite, our initial three tour dates are already full! So we added another date! The Autumn in New England Tour features guided tours of Chicago, Boston and New York, with visits to Niagara Falls, Portland, Maine, the incredible beauty of upstate New York, Vermont and New Hampshire and so much more. If history has told us anything, its that this new tour date will fill very quickly. Don’t wait to make this upcoming fall your most memorable on our new tour date for our Autumn in New England Tour! Click the photo above for detailed information regarding our Autumn in New England Tour! Our only Mackinac Island Autumn Tour with Availability! Each year, travelers come home and rave about our Mackinac Island Tour. We love the personality of the places on the itinerary. From the authentic Bavarian town of Frankenmuth, Michigan; to the nostalgia of Mackinac Island and the picturesque, quaint community of Door County, Wisconsin, there simply isn’t another tour like this out there anywhere. As the only Mackinac Island Autumn Tour with availability, we know this one will also go fast! Click the photo above for complete tour details! This entry was posted in Latest Tours and tagged bus tours, Bus tours from Iowa, bus tours from Nebraska, Moostash Joe Tours on July 5, 2018 by Moostash Joe Tours. Traveling abroad has never been easier! Now is an ideal time to experience another country with so many great upcoming opportunities with Moostash Joe Tours! Whether its retracing your ancestors footsteps, trying a new food or simply crossing something off your list, leave the details to us and enjoy the comfort, camaraderie and safety of group travel! Not too late! Airfare Included! A Huge Hit in 2017! Travel from Ireland’s east to west coast, featuring its most popular cities, charming small towns and most breathtaking scenic highlights. Start in Dublin, end in Limerick, including overnights in Waterford, Kinsale and Killarney. Highlights include the 668-foot Cliffs of Moher on Ireland’s west coast, the four ingredient ruby-red ale Smithwick’s Experience, private boat to witness the seal colonies on Garinish Island and so much more! Click the photo above for detailed information regarding our Ireland Tour! Airfare Included! The most inclusive tour of Italy! From its beautiful mountains, exciting cities, historical significance, marvelous art and architecture to its world-renowned tasty cuisine and inspired drinks, Italy offers it all! With overnights in Rome, the Chianti Hills, Montecatini, the Verona area and Padua, you’ll witness its extraordinary beauty along the way, accompanied by your professional tour director and the comfort of group travel. Truly the see-all, do-all Italian tour of a lifetime! Only 12 seats left! Book & Deposit by July 3, 2018 and receive $500 per person off the tour price! Nowhere else will you find such a variety of bus tours from Nebraska, lowest prices and top destinations than you will with Moostash Joe Tours! 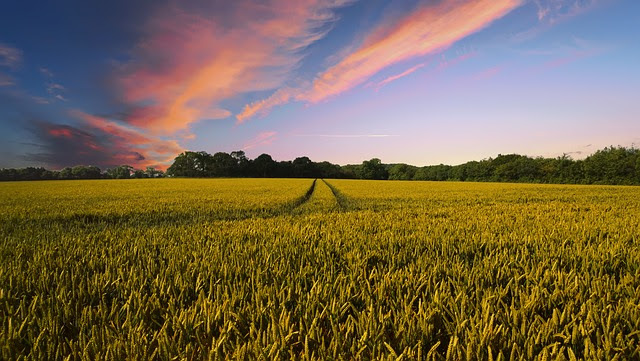 This entry was posted in Latest Tours and tagged bus tours from Nebraska, international tours, Moostash Joe Tours on June 19, 2018 by Moostash Joe Tours.